HCM City — The People’s High Court in HCM City yesterday opened a new trial in the case of 16 people who allegedly plotted to use petrol bombs to blow up Tân Sơn Nhất International Airport as the country was preparing to celebrate National Liberation Day. The defendants were charged with “terrorism to oppose the people’s administration,” a crime punishable by death in Việt Nam. Another defendant was charged with "failing to denounce criminals". The court reopened the case after receiving letters of appeal from 14 of the 16 defendants. In late December last year, the People’s Court of HCM City sentenced 16 defendants to between five and 16 years in prison on the charge of terrorism. The court concluded that the defendants were “enticed by subversive forces abroad to engage in activities against the administration and the people”, such as spreading false and distorted information on social networks, participating in demonstrations, recruiting members for reactionary organisations, and making weapons. Their acts posed serious danger to society, threatening national security and violating the people’s assets and health, the court declared. According to the indictment, Đào Minh Quân and Phạm Lisa are the leaders of an overseas "subversive" group. The two were responsible for hatching the terrorist plot, but they have not been arrested as they live outside the country. Since 2016, Quân and Lisa have used social media to find Vietnamese residents in Việt Nam to set up terrorist groups with the slogan “Kill all, burn all, and destroy all,” according to Vietnamese prosecutors. In April, 2017 Phạm Lisa told Đặng Hoàng Thiện and several others to use petrol bombs at Tân Sơn Nhất International Airport to sabotage the city’s celebrations of the end of the American War on April 30, 1975. Lisa provided Thiện with VNĐ12 million ($530) to make the bombs, prosecutors said. On April 22, Ngô Thụy Tường Vy and Trương Tấn Phát brought two petrol bombs placed in paper boxes to the airport, leaving one at the parking lot and the other at the international terminal. Passengers at the terminal who thought the box looked suspicious notified airport security. Thiện failed to detonate the bomb at the parking lot as he was too far away, so he moved the bomb to the international terminal where he successfully ignited it, sending passengers fleeing in panic. Investigators discovered that Thiện, Nguyễn Đức Sinh and their accomplices in early April burned down a police warehouse containing 320 motorbikes that had been impounded for traffic violations in Đồng Nai Province’s Biên Hòa City, causing nearly VNĐ1.3 billion ($57,300) in damage. 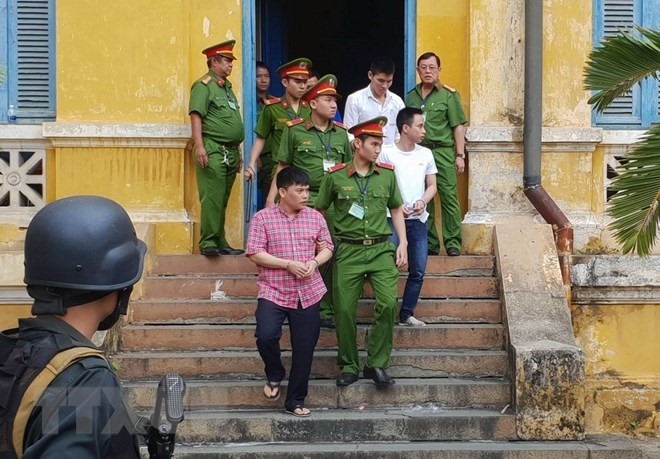 The other members of the group were allegedly plotting other terrorist attacks across Việt Nam, according to the indictment. They had bought guns in Cambodia and made petrol bombs in an attempt to attack supermarkets in HCM City and residences of Government leaders, the indictment said. They were also charged with staging protests outside HCM City’s Notre Dame Cathedral, according to investigators.